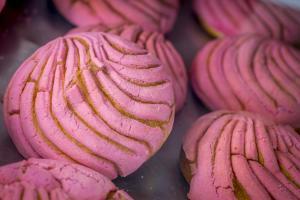 Amidst all of the smells of sizzling meats of the tauqerias and barbecue joints in downtown Kansas City, KS, you’ll find Bonito Michoacan Bakery. Located right next to El Bonito Michoacan, the popular taqueria and grocery store, the ethnic bakery is truly a work of art. The aesthetically pleasing combination of the bright piñatas hanging from the ceiling and the equally vibrant traditional Mexican delicacies will put you in awe the moment you step through the door. The giant glass cases along the walls are lined with traditional sugar-dusted pastries, sweet breads, American-style cookies, glazed donuts and more. If that’s not enough to get your mouth watering the luxurious tres leches cakes – a sponge cake soaked in milk and cream, and topped with silky smooth icing and fresh berries - just may do the trick. 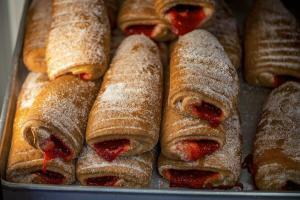 When you think about satisfying your sweet tooth, you may not automatically think about Cabela’s – but you should! 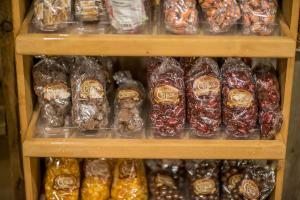 When you’re craving something chocolaty it’s hard to beat fudge, and the artisanal dessert offered at Cabela’s Fudge & Nut Shop is made fresh daily. 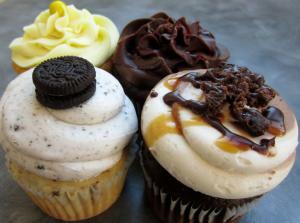 Amaretto Chocolate Swirl, Raspberry Cheesecake and Red Velvet are just a few of the featured flavors you’ll come across. If you’re more of a salty-sweet person you can munch on fresh roasted, cinnamon-glazed almonds, cashews and pecans. 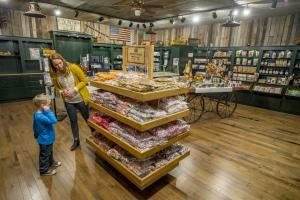 Candy connoisseurs will be delighted to see the shop also offers old-fashioned favorites like saltwater taffy, rock candy and melt-in-your mouth peppermints. The newest kid in downtown Kansas City, KS is causing quite a commotion. Kansas City Cupcake Co., a sister store to it&apos;s original location in Mission, KS, serves up its desserts from scratch.While the KCK location has been around for less than a year, the company is owned and operated by a local family with more than 25 years of experience. Each week the menu features new flavors like Pineapple Right Side Up Cake, Oh My Gosh Ganache, and Red Velvet. The clean and quaint storefront in the historic Strawberry Hill neighborhood is a perfect stop for weekday breakfast or lunch as well! You can choose from menu items that are equally as delicious as cupcakes, like fresh made breakfast burritos, soups, cafe sandwiches and more. Who says frozen yogurt is to be reserved for summertime? Who says it even has to be reserved for dessert? 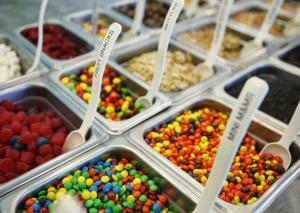 sweetFrog Premium Frozen Yogurt is known for its family-friendly froyo experience. 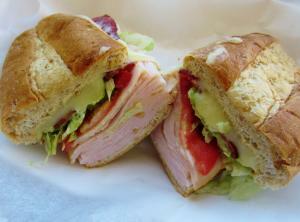 The poppy pink and green décor and the colorful toppings bar make you feel like you’ve stepped into a cartoon. You can be adventurous and go for toppings like mochi and mango poppers, or stick with the tried and true pound cake and rainbow sprinkles. This year Valentine’s Day falls on Tuesday, February 14th! 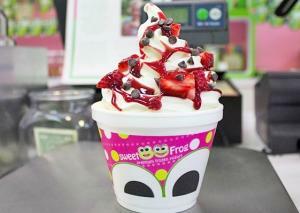 This means you can take advantage of Fill It Up Tuesdays at sweetFrog Premium Frozen Yogurt. Grab a small cup, and concoct your creation with as much frozen yogurt and and as my toppings as your heart desires (or as much as you can fit while avoiding spillage) for just $4. Your family and your wallet will thank you. Happy Tasting!